Interview with me on cute Italian art blog! New Jewelry by Classic Hardware! 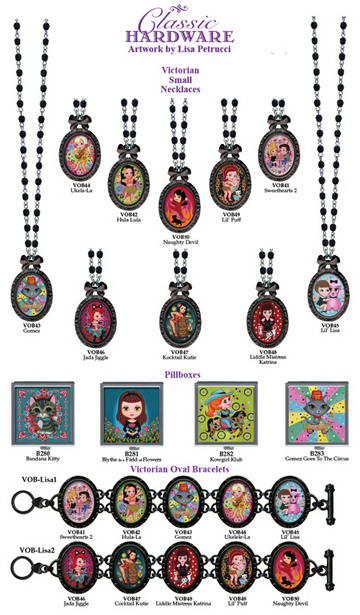 Classic Hardware “Accessories with Class and Sass” has produced a line of nifty new necklaces, pendants, bracelets and pillboxes featuring my art! You know you want some, so buy my fancy jools HERE! Doe-eyed girls in pink dresses, animated deserts, bubbly cartoon characters – at first blush these qualities seem to define the work contained in EdgyCute. But a closer look reveals other creepy imagery lurking about amongst the sweetness. Harry Saylor, owner of Orbit Gallery, has assembled a motley band of artists that dwell in the nether regions of our imaginations where malevolence and immorality transmogrify purity and naivety, breeding the EdgyCute aesthetic. While the work of these 47 artists varies greatly, it all strikes irresistible poses that have found their ways into museums and galleries, marketing campaigns and our dreams. List of artists include myself, Ana Bagayan, Gary Baseman, Becca, Chris Crites, Kirsten Easthope, Ryan Heshka, Angelique Houltkamp, Travis Lampe, Elizabeth McGrath, Mitch O’Connell, Kathie Olivas, Brandt Peters, Kevin Scalzo, Shag, Keith Weesner, Derek Yaniger and many more! hardcover art book is now available! Walk through a sparkling wonderland of make-believe, a cotton-candy-colored dreamworld of hearts, flowers and switchblades, of glamorous, dewey-eyed cartoon pin-up gals, kutie-pie kowgirls, leopard-skinned sweeties, hatchet-wielding honeys, and the cuddliest devil kitties Hell has to offer. The art of Lisa Petrucci is a honey-coated maelstrom of contradictions — the innocence of lost Americana, childhood nostalgia, and traditional feminine iconography all presented with a rebellious spirit. Kickass Kuties: The Art of Lisa Petrucci, is the first collection of the artist’s remarkable catalog, a hallucinatory tour through an emporium of cultural chaos, a bipolar gallery of imagery both sacred and profane. 112 pages of eye candy. Foreword by Kirsten Anderson, author of Pop Surrealism: The Rise of Underground Art. Published by Dark Horse Books. You can order personally signed copies of the book directly from Lisa! Go to my my Stuff for Sale area and order a signed copy today!